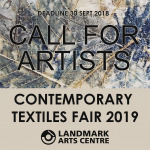 CONTEMPORARY TEXTILES FAIR 2019 is open for applications. 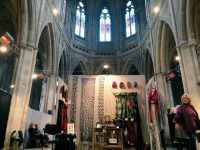 The Contemporary Textiles Fair is a well-established, high quality and highly regarded event, held in the magnificent Grade II* gothic surroundings of the Landmark Arts Centre in Teddington, South-West London. The fair is almost unique in its focus on textile artists & designer makers, unencumbered by suppliers, DIY kits, and other craft disciplines. It is this clear focus, together with the unique setting and returning visitors that make this event both enjoyable and successful, year after year. 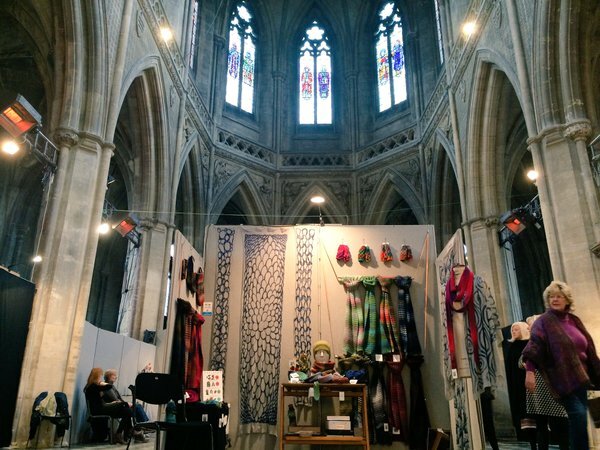 The Contemporary Textiles Fair is a well-established, high quality and highly regarded event, held in the magnificent Grade II* gothic surroundings of the Landmark Arts Centre in Teddington, South-West London. The fair is almost unique in its focus on textile artists & designer makers, unencumbered by suppliers, DIY kits, and other craft disciplines. It is this clear focus, together with the unique setting and returning visitors that make this event both enjoyable and successful, year after year. 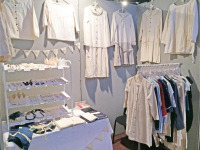 The Contemporary Textiles Fair is somewhere textile enthusiasts, collectors and art lovers can come to find artworks with texture, wearable masterpieces, handmade homeware, and unique curiosities. This isn’t granny’s knitted teacosy territory, this is contemporary quality! From stitched wall-hangings with conceptual significance, to carefully designed and hand-crafted objects; this fair does not discriminate – the art/craft barrier fades away to reveal exceptional talent in textiles. 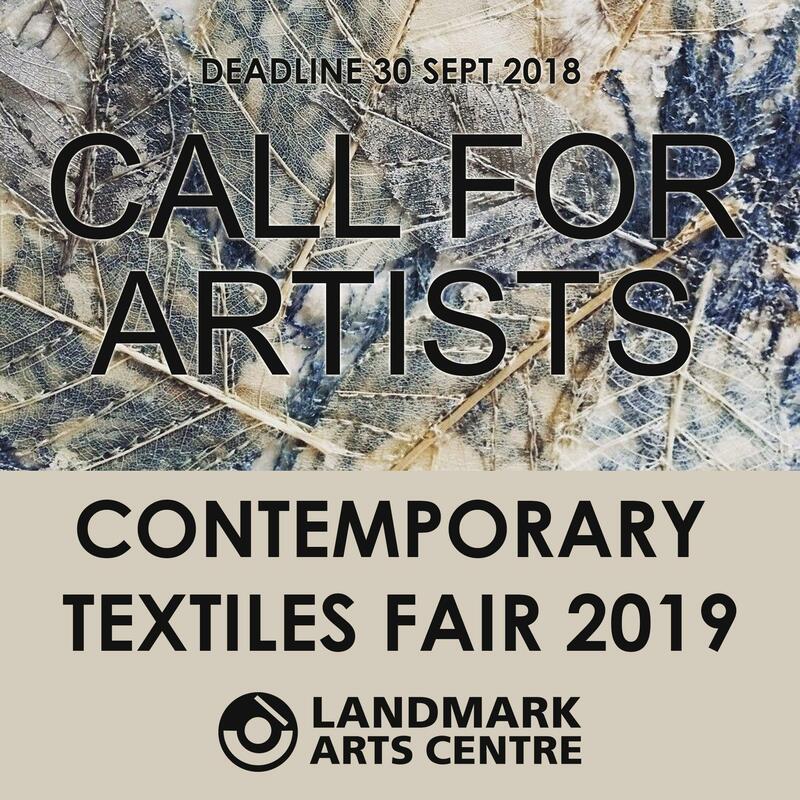 The criteria for applications is the same for all of the Landmark’s art fairs: individual textile artists and designer-makers whose work demonstrates creativity, innovation and quality, balancing the tactile and functional with the aesthetic. Please note that there is a selection process and, in the interest of keeping the show fresh, a ‘three year’ rule may apply; i.e if you have exhibited for three years in a row you may not be selected for one or two years. This year there are a limited number of stands being offered at a reduced rate to students and recent graduates. Please refer to the FAQ's and state the Raw Fibres option in the Stand Choices section of the application form. A shell-scheme stand with light, see stands section for more info. Marketing for this event will include: the Landmark’s quarterly events brochure which is distributed to local venues & mailed to Landmark members; full colour Contemporary Textiles Fair leaflets and posters; e-leaflet, paid advertising; PR, national and local listings; targeted mailing lists; AA sign posting and banners in the local vicinity. Advertising will include many national specialist magazines including Selvedge, Craft Magazine, and Embroidery Magazine as well as local general consumer magazines and local press. An e-flier will also be sent to exhibitors for use on their websites and social media platforms. A4 posters will be available on request. No deposits are required with your application. If selected and offered a stand, the balance must be paid in full as soon as possible to secure your stand. All payments must be made in full by the end of Jan 2019 at the very latest. Selections are made on the quality and creativity of the work submitted. Selections will be made by looking at the submitted images and professional website. If you are applying as a group or would like to be considered for a shared stand please indicate this on the application form and if successful, you will be contacted about this. Raw Fibres is a section of the Contemporary Textile Fair open to students, recent graduates and fledgling businesses to apply for. The stands available through Raw Fibres are set at a reduced fee to help support promising new textile artists. When applying please make it clear you are applying for a RAW FIBRES stand in the Stand Choices section of the form. You will be allocated a stand from the selected area if you are successful. Please add a paragraph to your Achievements & Upcoming Events section of the form outlining your eligibility and how this opportunity will help you and forward your textile practice. Eligibility for Raw Fibres: current BA or MA students, recent graduates (last 2 years), fledgling businesses (never done a big fair/event like this before and less than 1 year since launching business). The stands in the ‘Raw Fibres’ section of the fair are all 2m wide x 1m deep x 2m tall, constructed of the same grey weave boards as the rest of the fair. · Lighting: All 2mtr and 2.4mtr wide fair stands are supplied with one 150 watt exhibition light. Larger stands over 2.4mtrs wide are supplied with two 150 watt exhibition lights. · Extra power sockets are available on request and on a first come, first served basis at a cost of £5. The electricity supply for power usage within the building is limited. If a power socket is agreed for your stand, it will be sufficient to power a laptop, your own credit card machine or additional low wattage lighting up to 150 watts only. You must inform the Landmark Arts Centre what you will be using the power socket for. · Tables are available if required at the cost of £5 and must be booked in advance indicating size required. Once you have been offered a space then you will be asked to pay your stand fee in full; only once payment has been confirmed is your stand fully booked. Please note: no cancellation is considered for refund until all the stands have been sold and if a refund is relevant it will happen after the event. · 8 weeks or more before event – full refund, if stand can be re-sold, less 15% admin charge. · 4-8 weeks before event – full refund, if stand can be re-sold, less 25% admin charge. · Within 4 weeks of event – no refund. We look forward to receiving your application. Please get in contact if you have any questions. Textile artists, makers, designers and craftspeople who hand-make their own work. Art with a textile focus. We do not accept submissions from designers who outsource production of items through a 3rd party, and we do not accept applications from sellers of supplies. There is a preview evening after set-up on the Friday, from 6pm to 8.30pm. Tickets for your guests will be available. The fair runs from Friday (6pm-8.30pm), Sat & Sun (10am-5.30pm). Set up is all day on the Friday – all stands must be ready by 5pm. The Landmark Arts Centre does have disabled access for all of the ground floor where the majority of the fair will be held. Some bookable workshops may be run in the arts centre studio, where access is only via a staircase. Publicity includes a large mailout, adverts in various well-known relevant magazines and journals including Selvedge, Crafts (Crafts Council), Embroidery (Embroiderers Guild); plus local magazines such as Time & Leisure, and The Richmond Magazine. An increasing focus on digital advertising and a strong social media presence. Textiles, or heavy textile influence. Handmade. Fairly priced for both artists and consumers. How do I pay for my stand? You do not need to pay a deposit with this application. Once accepted you will need to pay the full stand fee to the Landmark Arts Centre to secure your place. You will be able to pay via BACS or cheque. Details on how to pay will be sent to you with your acceptance email. Please provide us with FOUR good quality images of your work. One image should, if possible, be of your work on display at a similar event. Image files must be named in the following format: Exhibitor Name_Title_Medium. And must be JPGs at 300 DPI quality. By submitting these, you are giving permission for the use of your images for promotional purposes; magazines, newspapers, web and social media; and the fair catalogue. ‘Raw Fibres’ is the new section of the Contemporary Textile Fair open to students, recent graduates and fledgling businesses to apply for. 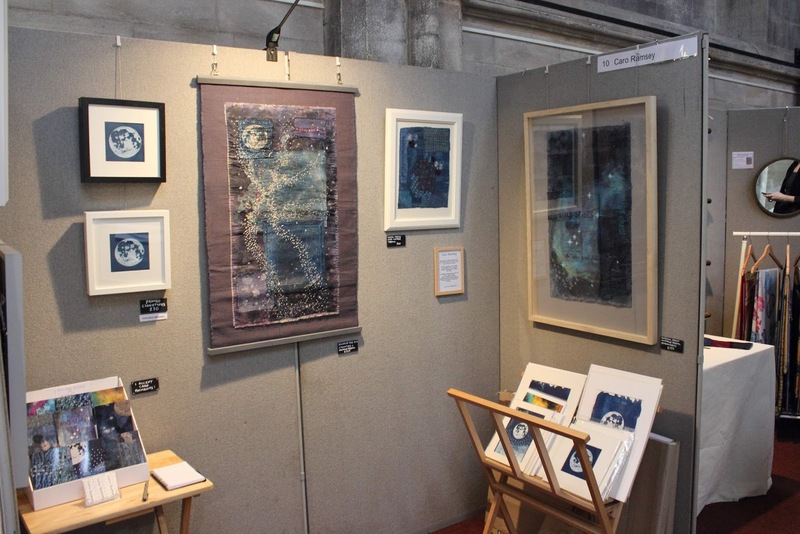 The stands available through ‘Raw Fibres’ are set at a reduced fee to help support promising new textile artists. Eligibility for ‘Raw Fibres’: current BA or MA students, recent graduates (last 2 years), fledgling businesses (never done a big fair/event like this before and less than 1 year since launching business). The stands in the ‘Raw Fibres’ section of the fair are all 2m wide x 1m deep x 2m tall, constructed of the same grey weave boards as the rest of the fair. When applying you will be asked for your preferred stand choices. 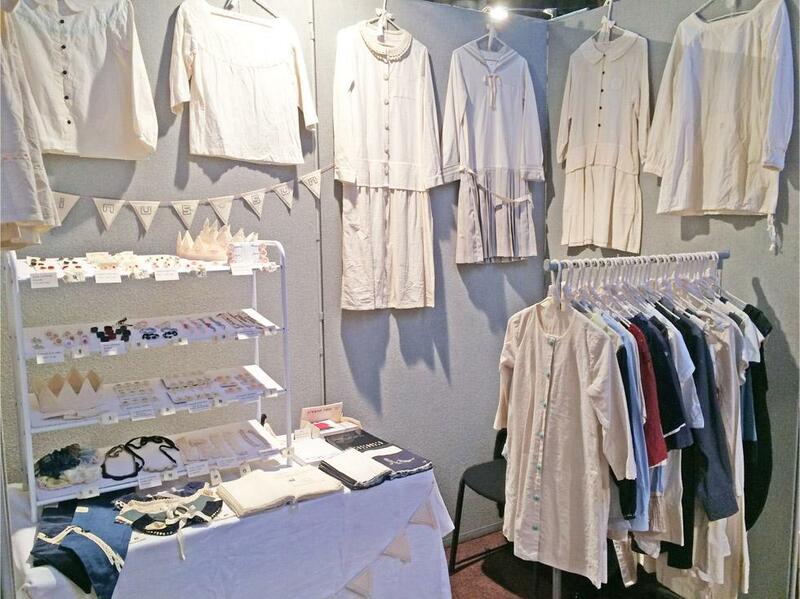 Because of the unique nature of the Landmark Arts Centre as an historic venue our stand choices are many and varied in size and shape, however all stand spaces come with shell scheme boards, some floor space and lit by a 150w halogen light. Your stand space will be clearly defined using panels covered with grey poly-weave. For hanging: Velcro, small pins or hooks from the top of the stands may be used. Absolutely NO nails, screws, blue tac or glue as these will dam-age the screens. All 2mtr and 2.4mtr wide fair stands are supplied with one 150 watt exhibition light. Larger stands over 2.4mtrs wide are supplied with two 150 watt exhibition lights. Tables are available if required at the cost of £5 and must be booked in advance. 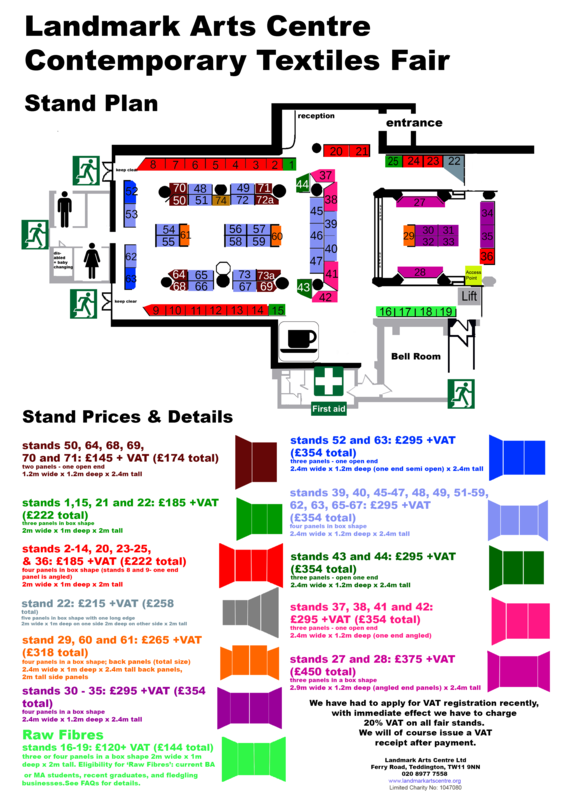 Please refer to our stand plan and images of the venue on the website to get a detailed idea of what spaces are on offer before you make your choices. Where can I get a stand plan/prices?